Here are our picks for some great places to stay in Emilia-Romagna, our featured region of the month. We begin with Bologna, the bon vivant capital of the region; I can personally recommend the two hotels below where I’ve had a very pleasurable stay. The only 5* star hotel in Bologna, this luxury property on Via Indipendenza, a shopping street in the heart of the historic center, has welcomed celebrities and royals in its more than 100 years of fine hospitality. 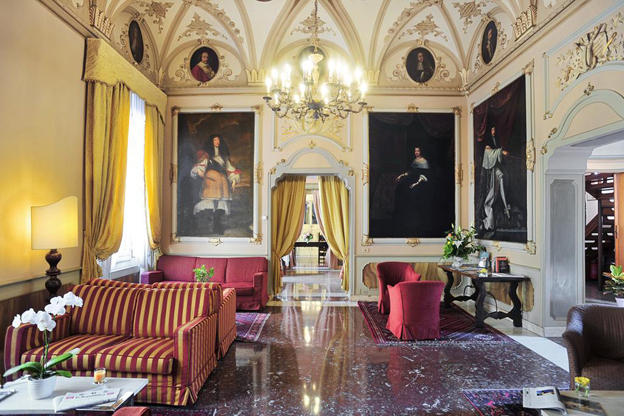 Located in a historic building designed during the first half of the 18th century, Grand Hotel Majestic Già Baglioni features 109 elegant rooms and suites decorated with original 19th century furniture. Don’t miss the Camerino d’Europa meeting room, graced by 16th century frescoes by Bologna’s famous painters, the Carracci brothers. Have an aperitivo at one of the lovely terraces, followed by dinner at I Carracci restaurant, where, surrounded by more Carracci frescoes, you’ll taste Emilia-Romagna cuisine reinterpreted with an inventive twist. See the remains of a 2,000-year-old Roman road as you descend toward the breakfast room, where a sumptuous buffet is laid out every morning. 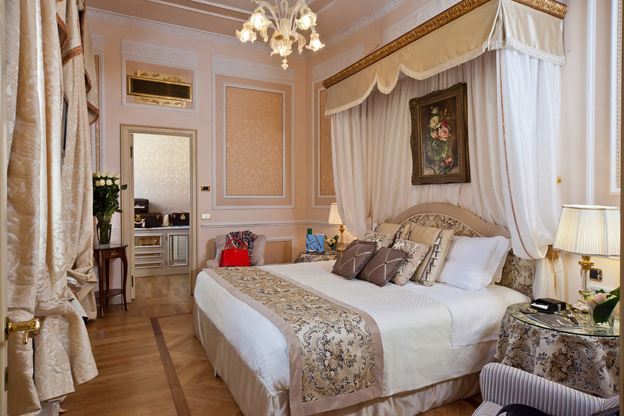 For more information and to book your stay --> Grand Hotel Majestic Già Baglioni. 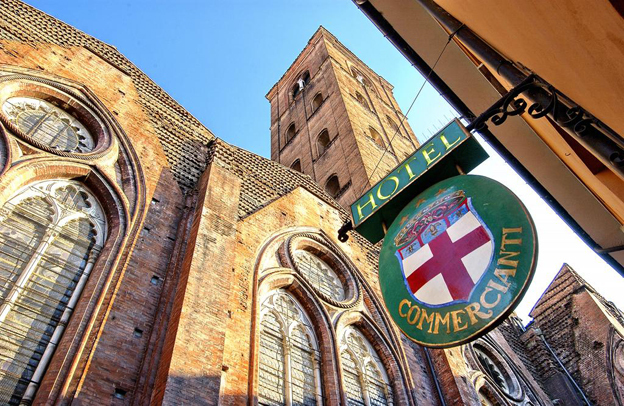 It is quite a thrill to sleep in a building that dates to the Middle Ages and even had an important role in the medieval history of the city: Art Hotel Commercianti in fact is housed in what was the first seat of the city council and later of the University of Bologna's law school. Touches of the building’s history are everywhere in the hotel, where you can even see a charred wooden beam reminiscent of a fire that once raged here. Each room is different and decorated according to a different theme, related to the history of the structure or of Bologna, highlighting the building’s connection to the past. The Suite della Torre is simply spectacular, located in the oldest part of the structure, the truncated tower; you’ll be surrounded by original frescoes and have amazing views of the Basilica of San Petronio. The hotel has one of the best locations in town: next to the Basilica, it is only a few steps from Piazza Maggiore, the heart of town. For more information and to book your stay --> Art Hotel Commercianti. Moving beyond Bologna, we head to nearby Modena, home of the best balsamic vinegar. Small town Modena packs a lot in a compact city center, where you’ll find Unesco World Heritage sites, one of the world’s best restaurants, balsamic vinegar producers, all within easy reach of the 4* Hotel Canalgrande. Located in the heart of the city, it is housed in a 16th century building originally built to house a monastery. The common spaces have maintained the same features they had back in the 18th century, when the building was transformed into a noble residence, while the rooms provide all modern comforts. You can unwind after a day of sightseeing in the quiet internal courtyard with terrace, where you’ll also find the restaurant offering local specialties. For more information and to book your stay --> Hotel Canalgrande. We now travel to lovely Romagna, in the south-eastern portion of the region, an unspoiled area of small villages, amazing art cities like Ravenna, beautiful countryside, while the coast, should you want to splash in the Adriatic, is never too far away. The perfect base to explore Romagna, the 4* Relais Villa Roncuzzi is set in the peaceful Romagna countryside. A noble residence built at the beginning of the 20th century, it has been renovated maintaining the original architecture; it features antique objects, furniture from the 1920s and ‘30s, design pieces, and local crafts. 21 lovingly decorated rooms, junior suites and suites provide all comforts. Some face the Zen garden, complete with swimming pool shaded by an ancient muscat and jasmine vine; others overlook the north side of the garden, graced by oaks, limes, holm oaks, old mulberry trees. You may be tempted to never leave, but you certainly can’t miss Ravenna, with its magnificent examples of Paleo-Christian architecture, or even lesser-known gems such as the 1st century BC Villa Romana or the Pieve di San Pancrazio. You can also easily reach the seaside or Bologna on a day trip. 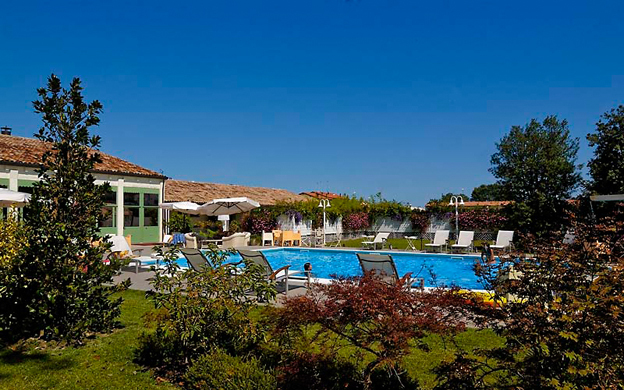 For more information and to book your stay --> Relais Villa Roncuzzi. This Bed & Breakfast in the heart of the Romagna countryside will provide you with quite a unique experience. The rooms are inspired by some of the animals that live in the park surrounding the property, a ‘corner of Africa’, as the owners like to call it. Flamingos, marabou storks, antelopes, zebras, cranes and colorful parrots live in the park, a labor of love by the B&B owner who has worked on it for 30 years. With a colonial style mixed with shabby chic design using vintage furniture, the rooms feel airy and sophisticated, while being functional at the same time. The peaceful garden that surrounds Ca’ Bevilacqua is ideal to read a book, sip a glass of wine or just relax at the end of a busy sightseeing day. The small town of Bertinoro is nearby and famous for wine, with many wineries open for visits. This is also a good area to rent a bike and explore on two wheels. 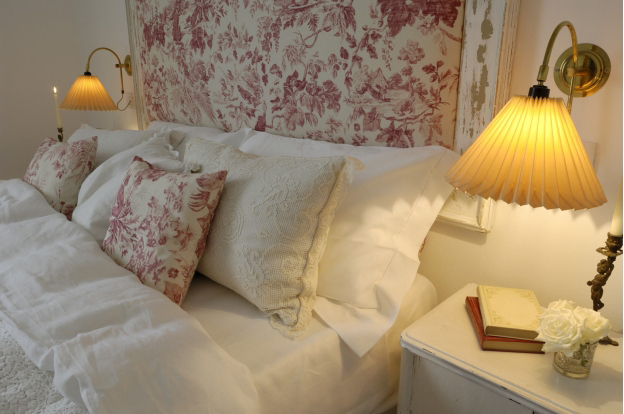 For more information and to book your stay --> Ca’ Bevilacqua B&B.